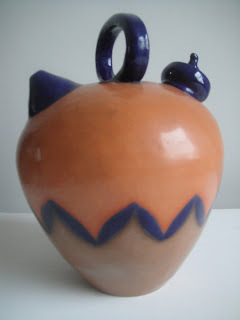 The botijo is a traditional water container which used to be made of very porous eartheware to allow water to evaporate in the heat and keep the contents cold. Si hablas castellano no te hace falta que te explique lo que es un botijo. Mi metodo de construir un botijo consiste en formar en el torno dos mitades y luego unirlas para conseguir una forma mas o menos esferica a la que despues pego los demas elementos. Mi method of making a botijo consists of 2 separate halfs thrown in the wheel which are later put together to make the body of the container to which I attach the rest of the elements. Botijos: Keep cool in a hot climate! Travelling around Leon (Northen Spain) this summer I came across a splendid museum, “El Museo del Botijo”. Housed in a 14th century castle/palace in Toral de los Guzmanes, Leon, it contains more than 2,500 examples of this peculiarly Spanish water container. Interestingly each item is clearly labelled with its region or country of origin (mostly Spain, with a few items from Mexico and Cuba) however, no mention of the maker is made at all. 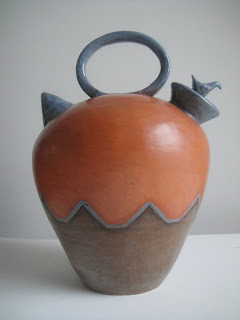 This highlights the status of botijos as traditional items conforming to a shape and decoration established by custom with little original input expected from the individual maker. 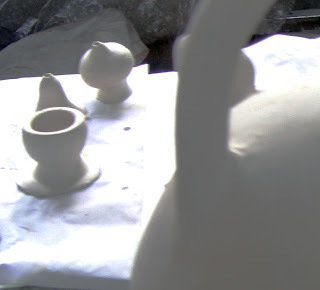 In spite of which there were quite a few examples that definitely owed as much to contemporary studio ceramic practice as they owed to tradition. I had never heard of a botijo museum, even though botijos have an iconic character in Spanish culture. They are perceived as an example of the rural, the unspoilt, the naturally beautiful, the functional low tech solution to a hot dry climate, and most of all they are perceived as “ours”. 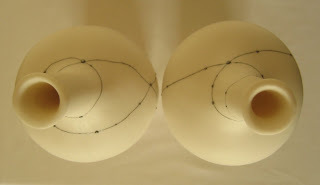 Should you be inclined to google the word “Botijo” you will find a wealth of sites ranging from the scientific through the artistic to the near pornographic. This last category surprised me, but considering that it has a rounded shape, 2 spouts and a handle, perhaps it is not so surprising. 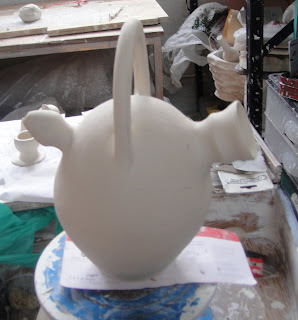 As my (now retired) teacher, John Chipperfield, once said: “you can have a lot of fun with spouts and handles”, so perhaps you may be able to excuse the hot blooded for making certain connexions. The more scientific sites give formulae to calculate the rate of cooling of the water in a botijo. I have decided against quoting any of these here because they looked rather complicated to me but they all try to quantify the rate of cooling in relationship to the temperature and humidity in the atmosphere and the shape and volume of the botijo. It appears that each gram of water consumes 600 calories when it evaporates, which makes it perfectly possible to cool 2 to 3 litres of water from 30 0C to 10 0C given the right conditions, very ecologically sound! 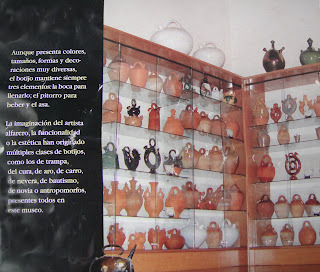 Examples of "botijos" from the Botijo Museum in the province of Leon, Spain. They are all labelled with the place of origen but not with the name of the maker, highligting the traditional character of this kind of vessel. Ejemplares de botijos del museo del Botijo en la provincia de Leon. Todos llevan anotado el lugar de procedencia pero no el autor, debido sin duda al caracter tradicional de este tipo de obra. 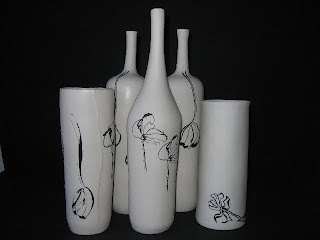 See below my own designs of porcelain "botijos" decorated with oxides. Muestras de botijos de porcelana con oxidos colorantes creados por mi. 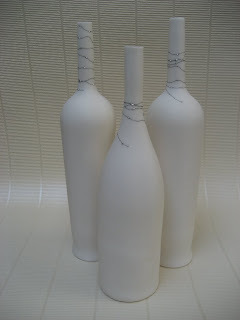 Porcelain bottles with silver thread decoration. 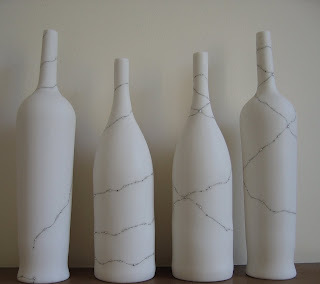 Botellas de porcelana decoradas con hilo de plata. Photograph by Laurie Huskell. Fotografia de Laurie Huskell. Grupo con botella, cuenco y bandeja. 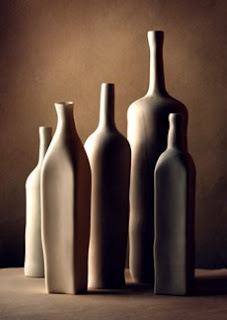 A series of decorative porcelain bottles.